LOL - at least it was made with a trashed wooden pallet I found in a dumpster about 10 years ago and not expensive wood! Brilliant! I can't believe you used trash wood - it looks really nice. How do you keep your ss grid so clean? That one is an auxiliary I use for class so it sees limited use and always gets cleaned. It was a prop for this picture. 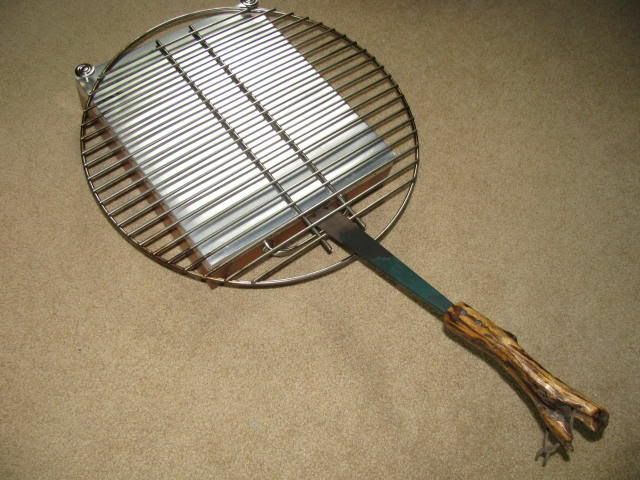 Ron, great idea, just wondering what you use to hold the grill while hot? Your like buddy, if something calls for a 2x4 he will use 4x4, something calls for a #12 wire he uses #10. 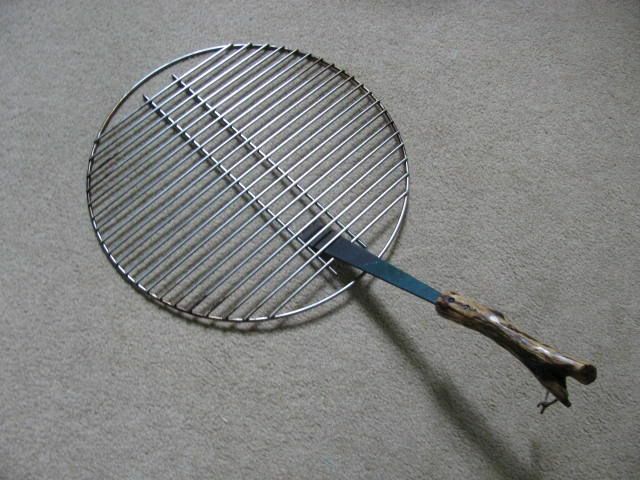 Beli, The reason I only made it 12" long was so I could insert my handy-dandy Grill Lifter into the side of the grill and place it there. After I re-read your post it finally dawned on me what you were trying to do when you said "staging table." Great idea! I've never thought about 'staging' my grid before putting it on the Egg. That probably explains why my knuckle hair remains short and some items look like I just dumped them on the grid. I got to thinking I may already have a solution to my trying it too. 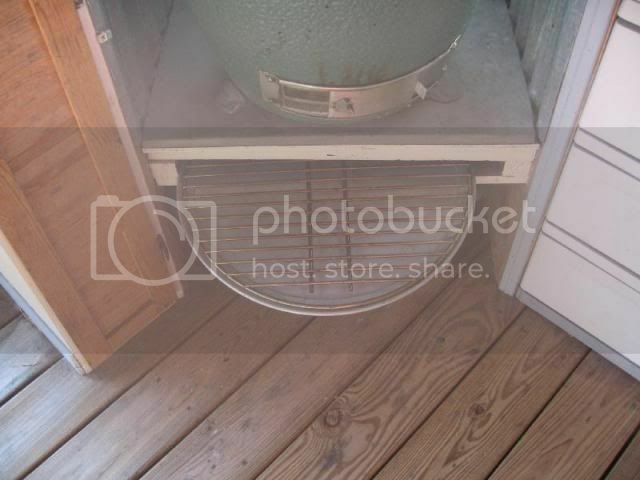 When I built my Chicken Coop, I built in a slot under the Eggs to house an 18" Pizza Pan from our local restaurant supply house. It works extremely well and is easy to clean for other uses. Here's a photo of it showing with a Large grid on it. It's very easy to transfer from and to the Egg using Lawn Ranger's Grid Lifter. But now the pan takes on another task. So I took this next photo to show it up on the counter where I would stage the food. I immediately saw the benefit of having the pan under the grid while I positioned or seasoned or basted the meat. 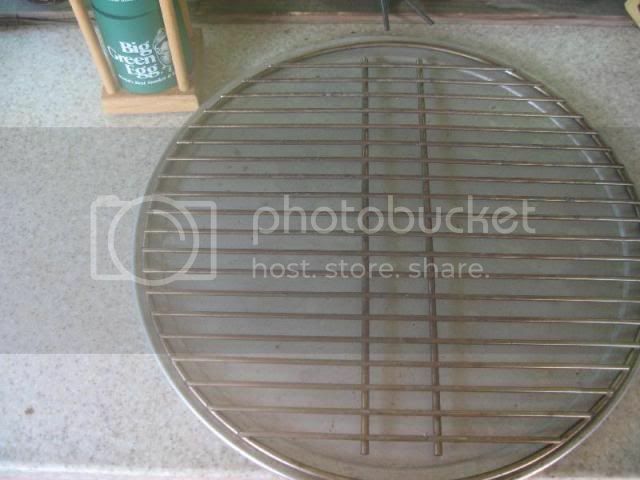 Actually I also use a round pizza pan that is perforated with 1/2" holes to toast, warm and cook several items regularly and that's why I wanted a flat surface with no obstructions - except for the two metal pulls to serve as stops.